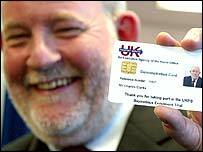 Claims the controversial ID cards could cost £300 per person to buy have been dismissed as "simply mad" by Home Secretary Charles Clarke. The estimate, made in a report due to be published by the London School of Economics, differs from the figure of £93 put forward by the government. An LSE representative told BBC Radio 4's World at One it had doubts on some of the governments costings. The row comes as a date for MPs to debate the plans was set for 28 June. The Government's revived plans for the UK-wide scheme will then face their first Commons test. It will be the second reading of the bill and the first real test of mood since an almost identical bill was abandoned before the General Election. The Conservatives, Liberal Democrats and some Labour MPs are expected to oppose the plans, which are likely to face a stormy passage in Parliament. Before the election 19 Labour MPs rebelled over the earlier bill on third reading. It was abandoned after the poll date was announced. Interviewed on BBC Radio 4's Today programme, Mr Clarke was asked about research from the London School of Economics (LSE), suggesting the cards could costs hundreds of pounds, rather than the £93 figure currently being quoted by the government. Mr Clarke said the reports were "completely wrong" and accused the LSE of running "scare stories". "We are slightly caught with this London School of Economics work, because they have got this survey and they are dripping out bits of it. They haven't shown it (to) us ... the full text at all, and they are really running a media campaign with scare stories of this type which it is very difficult for us to deal with because they won't show us the basis from which they are doing the work," he told the programme. "What I can say is that the kind of figures that have been talked about in the media based on their briefings are total nonsense," he added. Later on the station's World at One programme a member of the LSE's advisory group Patrick Dunleavy, Professor of Government, said its figures were not "plucked out of the air". "There is a considerable area of doubt," he said, such as the cost of equipment for making the ID cards, the cost of enrolling people and checking data. Shadow home secretary David Davis later criticised Mr Clarke's description of the £93 ID card price tag as an "indicative unit cost". "This plastic poll tax will mean that hard-working families with children will end up paying time and again for their ID cards and any changes that are made to their personal details," he said. "Charles Clarke should be honest about the real cost of the cards now, so that the British people can make an informed choice, based on the facts, not the Home Secretary's bluster."